In this series, we review London's restaurants from an entirely vegetarian angle. 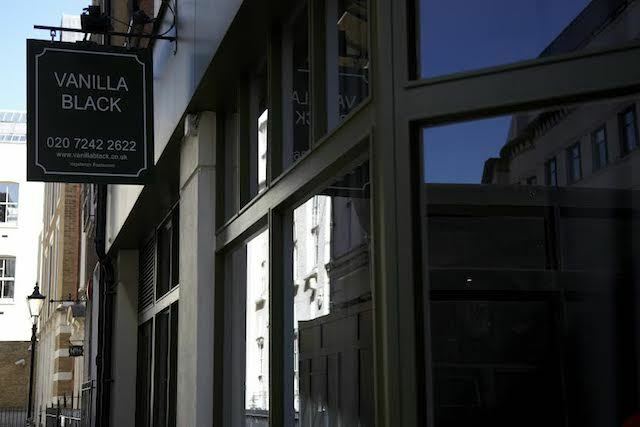 London’s only ‘fine dining’ vegetarian restaurant Vanilla Black divides opinion. Like the Marmite dumplings on its menu — served with yellow pea soup and sweet onion puree, since you ask — you’ll either love it or hate it. Certainly you won’t be sitting on a fence; you’ll have an opinion about it. We love it. But what gets people into such a tizzy? The Modern English restaurant’s adventurous cooking and unusual flavour combinations leave some infuriated and confused, and others awe-struck and ecstatic. It’s a brave chef that serves quinoa with brie ice cream as a starter, for instance; or pairs roasted white chocolate with cep mushroom custard for dessert. This is cerebral dining, and it’s difficult to pull this kind of thing off. The influences here are both classical and molecular; and a lot of thought has clearly gone into the unorthodox pairing of ingredients and techniques. We’ve eaten here several times over the years, and although in the past some dishes have been a bit hit and miss, there have always been many more hits than misses. But we’ve occasionally wondered, “yes, that was clever — but was it delicious?”. This time the cooking is more consistent, and seems to have matured and come of age. Either that, or we ‘got’ it. Another issue here is that of expectation. Their website warns: “apologies in advance, no pasta bake or vegetable curry”. Vegetarian food is associated with homeliness, wholesomeness, healthy eating or classic ‘ethnic’ fare. It’s still unusual, in 21st century London, for a vegetarian chef to take risks and do something completely different. How sad. And many will baulk at having to pay £29.75 for two courses or £39.50 for three courses because the meal doesn’t contain meat. Why? We think it’s excellent value for a smart City restaurant. Artisanal British cheeses — used to stunning effect here — and top-quality vegetables don’t come cheap. Dishes are cooked using a dazzling array of technical skills and expensive equipment. Elaborate, on-trend processes like pickling, fermenting, foraging and making gels abound. 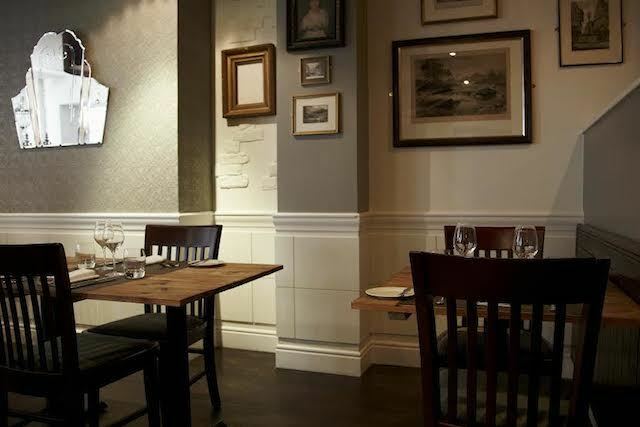 Chef Andrew Dargue and his wife Donna Conroy, who works front of house, both originally from Teesside, started Vanilla Black in York a decade ago. They chose the name because they like the colour ‘black’, to which they randomly attached the word ‘vanilla’ as they didn’t want it to sound “too vegetarian”. It was such a hit that they relocated to London in 2008. The two-room venue is situated in an elegant townhouse in a secluded side street, and decorated in understated greys and creams. There are framed pictures, oversized retro lampshades, and a small lounge area by the front reception desk for a pre-dinner cocktail. There’s crisp napery and polished silverware on the tables. The ambience is hushed and the feel conservative. Our dinner kicks off with a tangy, refreshing amuse bouche of grapefruit gel with marmalade-like pomelo peel and star anise cream, served in a shot glass. Warm, fresh rye and mixed seed breads are crusty with a soft crumb. 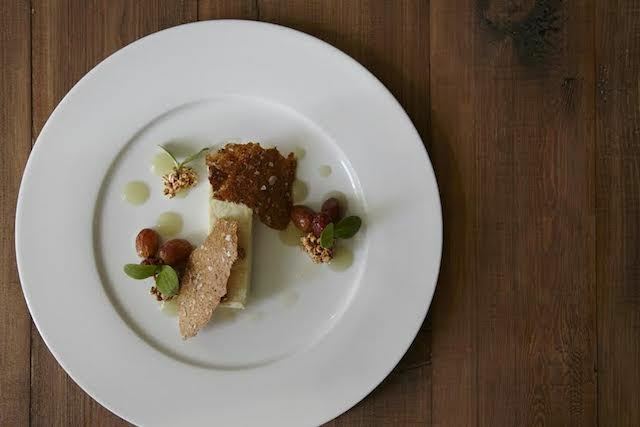 Rectangular slabs of Yorkshire blue cheese ‘toastie’ come with shards of light, crisp rye flour crackers, roasted red grapes and clusters of puffed wheat — an inverted take on cheese, crackers and grapes served as a starter. The wheat clusters are a little too hard, but otherwise the flavours and textures work very well together. 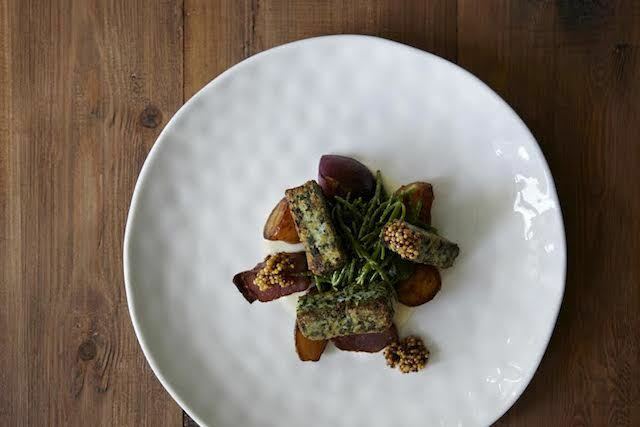 Little hillocks of pickled mustard seeds — akin to wholegrain mustard, but much sharper — bring an intense savoury tang to seared seaweed with cabbage, pickled heritage purple and yellow potatoes, soda bread sauce and ‘foraged seaside vegetables’. The latter on our visit includes sea asters and sea beet, but they change according to availability. There is a lot going on in the plate, with plenty of layers of flavours. And we couldn’t resist one of their most talked-about dishes, whipped jacket potato with crispy shallots, tomato syrup and Wensleydale. Potatoes, onions, tomatoes and cheese: what’s not to love? We're blown away by how silky-smooth and light-as-air the pureed tubers are. We found out afterwards that they’re aerated with a cheffy gadget called an ISI machine. To finish, baked black treacle sponge, perhaps a little too salty for some, is light yet substantial and moreish. We couldn’t stop eating it. It's offset by mellow cubes of ‘cardamom milk’, parkin crumbs and succulent little pieces of mandarin segments, cooked in their own juice with mandarin gel. Our party included seven food professionals visiting from the US, including fine dining chefs and a 90-year old former food editor (none of them well-known here). Between us, we tasted most items on the menu, with the omnivore Americans ooh-ing and aah-ing at every dish. 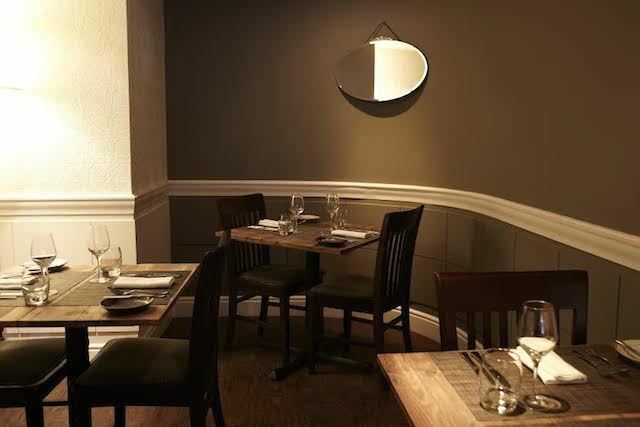 We paid around £60-£65 per head, including wine, water and service charge — but we didn’t choose the cheapest wine and had ordered extra items to try, so you can dine here for much less. Staff are charming, well-informed and on-the-ball. Booking high-end restaurants in London can be a nightmare, but here it's a breeze. No ‘sittings’ imposed, no group menus, no complications. But why is Vanilla Black only ‘Michelin recommended’, why doesn’t it have one star? And why has no other veggie chef subsequently tried to do anything remotely similar? Does it push the boundaries of vegetarian dining too far? For some people, yes. For us, it was one of the most joyous and memorable restaurant meals in a long time. So, then, it was clever — but was it delicious? Hell, yes! Vanilla Black, 17-18 Took's Court, EC4A 1LB. Tel: 020 7242 2622. Images kindly supplied by the restaurant. We review strictly anonymously, and pay for food, drinks and service charge.